Brewing has been a human activity ever since the beginning of urbanization and civilization in the Neolithic period. Beer is a product valued by its physico-chemical properties (i.e. quality) as much as by its entanglement with religious, culinary and ethnic distinctiveness (i.e. tradition). Accordingly, the history of beer brewing is not only one of scientific and technological advancement, but also the tale of people themselves: their governance, their economy, their rites and their daily life. 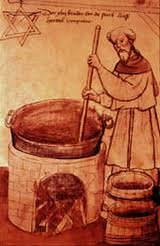 It encompasses grain markets as well as alchemy. There exists a vast literature on beer and brewing. Among the most comprehensive reviews are the books by Arnold and Hornsey. Some aspects have recently been covered by Unger and Nelson. A major problem is posed by language – there is an abundance of information available in, for instance, English, German, Dutch, French, Danish or Czech, which, due to insufficient command of the various languages, is are not acknowledged by other authors. If evaluated in a broader context these publications would yield very interesting insights. There are two fundamental limits to any history of beer brewing. First of all it is the unambiguous deﬁnition of its object, namely beer. Does ‘ beer ’ broadly refer to fermented beverages based on grain or does it designate the hopped drink obtained from liqueﬁed starch after fermentation with speciﬁc strains of Saccharomyces yeasts, which is understood to be beer in our times? Although including the history of all grain – based fermented beverages would exceed the scope of this chapter, a consideration of hopped beer only would be too selective, and would ignore the fundamental roots of brewing technology and beer culture.